Since these margaritas have entered my life, I’ve gone through a considerable amount more of tequila every week. My homegirl Shawnda had mentioned them to me in passing about a month ago, and I couldn’t wait to try them. Literally couldn’t wait either, I hounded her to give up the recipe early. Thankfully, she obliged and gave up the goods. Made a batch of them up that night, and voila! My new favorite summer drink. I love a small sprinkling of salt on my chunks of cantaloupe anyways, and let me tell you – the salt rim is everything I’d hoped it would be. Even now, at 9 AM on a Monday, it’s making my mouth water. The color is just gorgeous too, a lovely sherbert colored orange. This recipe makes about 4 or 5 drinks, so it’s perfect for poolside or at a backyard BBQ…or, drinking all to yourself on a Friday night. These are so good, they had my homebrewing husband drinking them! And, he doesn’t do tequila. They’re that good, folks. I know it’s only Monday, but I’m already looking forward to next weekend and making up another batch of these perfect summer cocktails. Add the lime juice to a pitcher.Over medium heat in a small sauce pan, heat sugar and water, stirring until clear. Remove from heat and add to the lime juice. In a food processor or blender, process the cantaloupe for ~60 seconds until completely obliterated into a fine pulp (you might need to add a few pieces at a time if using a blender). Pour pulp into a fine mesh strainer set over a large measuring cup or small bowl and strain, lightly pressing the solids until you get 1 cup of liquid. 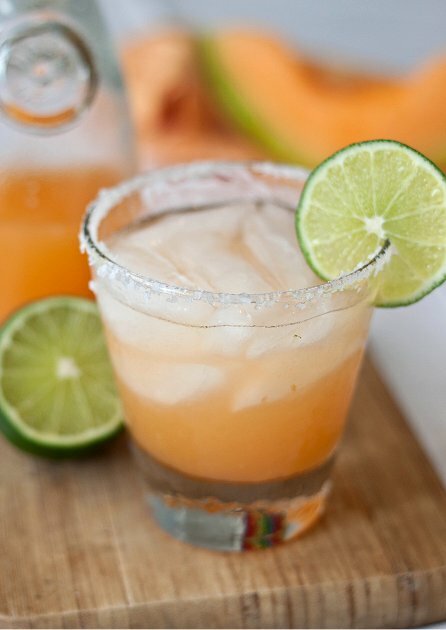 Add cantaloupe juice to the pitcher, along with tequila and orange liqueur. Serve in salt-rimmed glasses, over crushed ice. How many drinks does this make ? Marla, about 4 or 5. I agree with Laura, great color. Delicious looking drink too. This is a margarita I’ve never had, and I’m totally intrigued!! Love it!! These sound delicious! I’ve been looking for a new recipe to use my margarita glasses, this may be it! Monin Flavorings makes a Rockmelon Cantaloupe Syrup that is delicious! Simply add 3 tablespoons to your 12 oz. margarita recipe. It has an excellent, authentic flavor and can help maintain consistency when local melon is under ripe or out of season. I love Monin syrups to make super-easy flavored margaritas! Wish I could find them more easily in my area.